Friday 20th January 2017 Make Resurfacing Great Again! 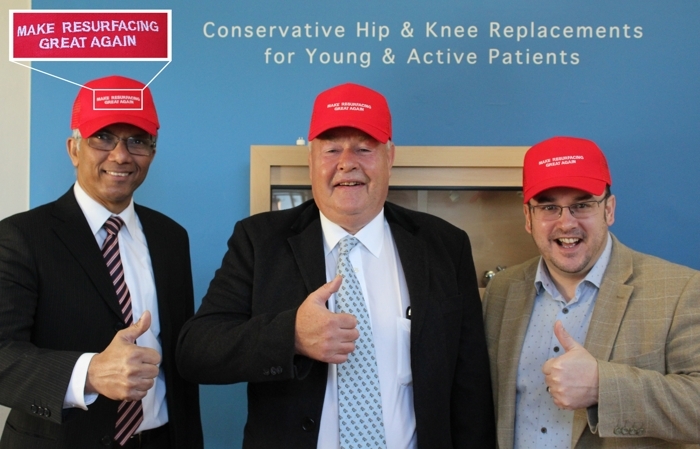 This InaugurationDay, Mr McMinn says ‘Make Resurfacing Great Again’, pictured here with Joseph Daniel (McMinn Centre Director of Research) and Terry Smith (Managing Director of Jointmedica). Published on Dec 22, 2016 – A video lecture presented by Mr McMinn giving an update of Hip Resurfacing in December 2016. There are currently two basic surgery options available for hip replacement, a Hip Resurfacing or a Total Hip Replacement. A total hip replacement, THR, has been the gold standard for many years. THR is major surgery that can result in a long post-op recovery and often limits your activities depending on the type of hip device that has been used during surgery. Hip Resurfacing is bone conserving, not requiring the removal of a large portion of the femur, and allows the patient to have an active life with no restrictions after surgery. Patients are able to return to sports, activities and pain free lives. Many hip resurfacing questions are answer in the FAQ section and hip resurfacing information section. The first BHR was implanted in July 1997 and it is unchanged until present day. 99.5% of these patients were happy at 5 years. Derek McMinn has done over 6000 total hip surgeries and over 3,500 MoM Hip Resurfacings. His 10 year survivorship for the BHR (Birmingham Hip Resurfacing)in a series of 3095 performed up until December 2009 is 97% from all patients. His first metal/metal resurfacing prototype was implanted in 1991, and the current design, the first BHR was implanted in July 1997 and has not changed in any way since then. possibility of returning to competition in a series of patients.